Ever wondered where all the old Minis went when the new BMW variations appeared? 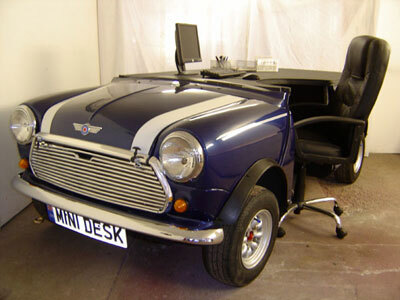 With the looks of it, to a company called Mini Statement, who are currently selling office desks made from classic Mini Coopers. They’re certainly eye-catching – and all are made to order to your requirements. You get a choice of desk top – leather, wood, metal or coloured vinyl, your Mini sprayed to any colour scheme, fully working headlamps, hazards and spotlights, a stereo set into the dash with speakers in the parcel shelf and a choice of rims and tyres, along with personalised number plates. The price? Well, that’s not currently forthcoming from the company, but you can get in touch via their website if your bank account is currently looking particularly healthy.